Top climate change scientists from 39 countries say they are 95% certain that global warming is manmade, according to a new report from the United Nation’s Intergovernmental Panel on Climate Change (IPCC). The report, released every six years and reviewed by over 1,000 experts, also warns that the upper limit on greenhouse gases will be exceeded within decades if emissions continue at the current rate. Climate change is a leading global concern among the public, too, according to a recent Pew Research Center survey of people in 39 countries earlier this year. A median of 54% identify it as a major threat, the highest among eight threats tested this spring. Only financial instability conjures a similar level of concern. 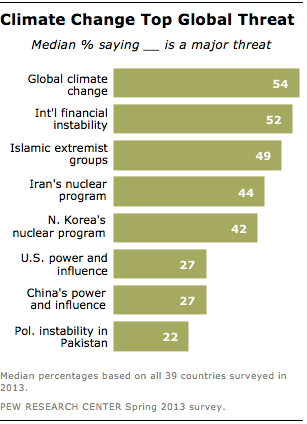 At least half the public in 24 of the 39 countries say climate change is a major threat to their nation. People in Greece (87%), South Korea (85%), Brazil (76%), Lebanon (74%) and Japan (72%) express the highest levels of concern. However, China and the U.S., the world’s largest greenhouse gas emitters, are among the least worried about climate change. About four-in-ten Americans (40%) and Chinese (39%) say it is a major threat to their countries. Only those in the Czech Republic, Jordan, Israel, Egypt and Pakistan are less concerned than the Chinese and Americans. There is a sharp partisan divide on this issue among Americans, with Democrats (55%) more than twice as likely as Republicans (22%) to view climate change as a major threat. Another Pew Research survey in March also found large partisan divisions on views toward global warming. While 87% of Democrats believe there is solid evidence of global warming, just 44% of Republicans agree. Similarly, Republicans express more doubt about humans’ role in climate change; 19% say global warming is a result of human activity compared with 57% of Democrats. Cathy Barker is a Research Analyst at Pew Research Center’s Global Attitudes Project.